At Maids & More, our passion is exceeding expectations. From start to finish, we provide excellent customer service that will delight you. You’ll notice our friendly, helpful attitude from the moment you contact us until the moment our professional technicians drive away. Great cleaning begins with great customer service, and we’re ready to become your cleaning service. We offer comprehensive cleaning solutions for homes and businesses in Omaha and surrounding areas. From scheduled cleaning to emergency deep cleans, and everything in between, we can customize a service plan that will address your specific needs. We offer general cleaning, carpet and upholstery cleaning, hardwood floor cleaning, window washing, tile and grout cleaning, pet odor removal, and more. We started Maids & More locally to offer you a professional, affordable service from people you can trust. What is Maids & More? Our experienced and professional technicians love what they do, and that’s our secret to providing you with the friendly service and attention to detail we are known for. All Maids & More employees are carefully screened, background-checked, bonded, and insured. We provide our technicians with comprehensive training to ensure your complete satisfaction with the finished work and the people who performed it. We use the latest, top of the line equipment and supplies to ensure that our work exceeds your expectations. We know that superior tools result in superior quality, and we don’t settle for average when it comes to equipment and safety. Regardless of your cleaning needs, we have the technology and the solutions to get the job done. 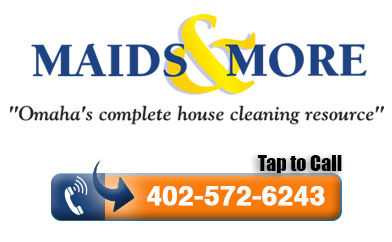 Maids & More is more than a cleaning company. We are real people who take pride in providing unparalleled service to other real people. We treat every customer with sincerity, care, and diligence. Contact us today and experience the difference. We offer no-obligation, same-day estimates and we are ready to be the best maid you’ll ever have.